I spent August 2006 in South America searching for some good backcountry ski touring. It turned out to be a fantastic trip, probably one of my best ski trips so far. I managed to do some ski touring in Argentina and Chile. I checked out some of the day trips around Bariloche, made a trip to Refugio Frey, skied Pitre above El Bolson, and did a 1 week tour of some volcanoes in Chile, making ski ascents and descents of Volcan Lanin, Volcan Villarrica, Volcan Llaima and Volcan Lonquimay. 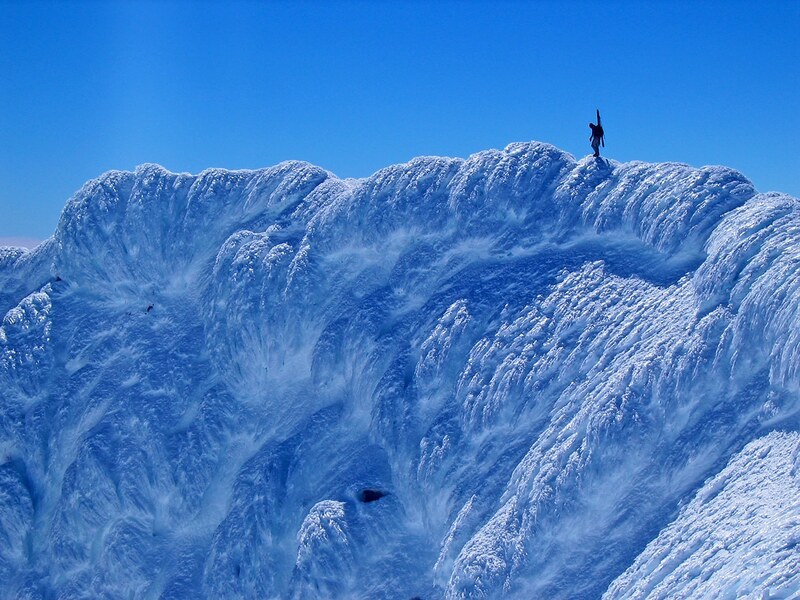 The Chilean volcano tour was probablay some of them most fun ski mountaineering I’ve done. The volcanoes make fantastic objectives for ski tours. They offer large relief and excellent spring corn which make for phenomenal ski descents. The ski touring in this part of the world is highly recommended. Click on the links below to see my trip reports. August worked out well in 2006. From the sounds of it the best time to tour, and the time when most ski tourers show up is end of August. The touring is reportedly good through to near the end of October and possibly (in a really good spring season) into November. If you go in August be aware that the first 2 weeks are big holiday times down there so it is critical to book a place to stay weeks in advance. The second half of august and beyond is less busy. My trip was from August 4th to August 31st and I think I got pretty lucky. It dumped for the first week I was there, after which the weather was fantastic for the remainer of my trip. The snowpack transformed from a mid winter pack to a bomber spring cycle in a matter of days around the time that i left Refugio Frey, which made for great ski touring on the volcanoes. Those volcanoes really are amazing ski mountaineering objectives! The skiing conditions are much better, the days are much longer and the weather is slightly better later in the winter. People ski in South America every month through from July to November but the window for the best conditions appears to be about 15 September – 15 October, with slight variations depending on where you are and what altitude you are skiing at. August tends to be very cold and windy, with lots of windslab and unconsolidated snow on the volcanoes, bear in mind that the equivalent month in the northern hemisphere is February. The ski resorts around Santiago have an earlier ‘best’ season due to them being quite a bit further north, they are probably at their best on average, from mid-August to mid-September. In summary, you can ski tour on the volcanoes etc in August, its just not as good. Bring your touring gear, you won’t find rentals. There are lots of huts, so I didn’t feel the need for a tent, but some huts are basic so having a sleeping bag and pad as well as a stove ond pot was nice. If I were to do it again I woudl bring a rope and harness as there are a few peaks that are heavily glaciated that I would like to do: Tronador and Osorno being at the top of the list. Some of the locals said that by the spring skiing season you could climb those peaks without a rope, but I’d probably bring one just to be sure. An ice axe and crampons are a very good idea for the volcanoes. For climbing the volcanoes it’s a good idea to have a helmet, ice axe, crampons and ski crampons. To climb Lanin the rangers require that you have all the normal ski mountaineering gear including ice axe, helmet, etc, plus a programmable vhf radio to call for help in an emergency. You can buy some outdoor gear in Bariloche. Patagonia Outdoors seemed to be one of the better outdoor shops in town. White gas can be purchased in town. I bought some from the hardwear store, it was being sold as a solvent. Bariloche makes a great base for ski touring. There are lots of folks in the area to hook up with for tours, both argentino and foreign. I stayed at Hostel 41 Below which made a great base for the trip. I highly reccomend this place. A bed in a dorm costs $25 pesos per night. If you have the cash it consider paying $75 pesos per night for a private room and you’ll get the best of both worlds, hostel experience with a private room at night. I think the privates book up pretty early, so I’d reserve way in advance. Tell them you’re a backcountry tourer when you book, Paul, the owner, is a great guy and he’s into touring with a splitboard. Another option to consider is the Casita Llao Llao or Studio Llao Llao; both very nice accomodations a little ways out of town to the west. If you’re keen to climb the volcanoes it make a lot of sense to rent a car. Besides, it’s fun to have the freedom! I rented from a place in Bariloche called Correntoso (telephone: 427737 or 15611545) and they were great. a car for a week with unlimited km (which many rental agencies didn’t offer), a ski rack and permit to cross to Chile was about $275 canadian (770 pesos). I did not need an international drivers license. If you want to climb the volcanoes make sure you get the permit to take the car into Chile! I tried to check prices at most rental car companies in Bariloche and Correntoso seemed to be the best. When I flew down to bariloche I didn’t really know anyone in the area, so I had to meet ski partners down there. The strategy that I found worked best was to spent my initial days resort skiing and everytime I saw someone with backcountry touring gear I would approach them to see if they were interested going backcountry skiing. The strategy worked really well and within a week I had a bunch of folks to go ski touring with. My advice: be outgoing and it’ll work out just fine. I also posted a notice on the bulletin board of Club Andino in downtown Bariloche and got a few responses that way. The snowpack around bariloche seemed quite similar to a coastal snowpack. The temperatures are pretty mild so it seems like things consolidate quite quickly. I don’t think they get a ton of surface hoar or depth hoar, but could be wrong. I don’t think they get as deep a snowpack as around Whistler. I think one of the major factors in this area is wind. The storms seem to come with A LOT of wind. If you want to hire an internationally certified mountain guide while you are in the area I totally recommend Jorge. He owns the guiding company Andes Cross. Jorge is a total dude and I enjoyed hanging out with him down there. He knows the area well. Another guide operator in the area who I hooked up for a couple days skiing was Zach. He runs ATAC Patagonia which offers everything from rafting to mountain biking to horseback riding. He is a great guy and we got some great tours, especially one nice day on Cerro Lopez. Another Bariloche-based full mountain guide is Walter Rossini. Walter runs a wide variety of tours and climbs; details about his company can be found on his website at www.patagonianguides.com. Here are a couple blogs with lots of ski condition updates. There are fantastic sources of current conditions information. LivingInPatagonia.com – Great blog from a Bariloche based skier who runs a very nice vacation house and studio outside of Bariloche at Llao Llao. unofficialandes.com – Another great blog focused on the Las Lenas area. If you are in bariloche for a couple weeks or more, get a cell phone. Apparently for $150 pesos you could get a prepaid cellphone that included $50 pesos worth of calling time. One of the biggest frustrations I had was keeping in touch with potential ski partners and a cell phone would have been ideal. Other folks I met had them and said it was cheap and worthwhile. There are tons of internet cafes in Bariloche as well as many other of the tourists towns in Chile and Argentina. Generally the costs of using the internet is very, very cheap, less than one dollar per hour. Things are quite cheap in Argentina compared to North America. I spent almost 4 weeks skiing in the region, mostly in Argentina, but one week in Chile where it is more expensive. Over that time I spent about $1100 canadian on all living expenses. This includes food, lift tickets when I resort skied (maybe 3 days), accom in a hostel, buying maps, a bit of money for gifts, and gas costs for the rental car. The one additional expense was $275 canadian for a rental car for 1 week. These costs do not include the costs of flying to and from Bariloche. I took travelers cheques but found bank machines in the major tourist towns that worked with my bank card, so I didn’t use the travelers cheques. Visa and mastercard seemed to be widely accepted. I flew from Vancouver, BC, Canada to Buenas Aires with Continental, the flight cost about $1400 Canadian and was booked through Global Connections, a consolidator that does a bunch of latin american work. It was the best price I could find. I didn’t stay in Buenas Aires, I flew to Bariloche the same day I arrived on a Aerolineas Argentina flight which I booked online from home ($150 US). On my return I flew from Bariloche to Buenas Aires with LAN Airline, agian booking the flight online, it was slightly more expensive then the flight with Aerolineas Argentina (apparently the first couple weeks of august is cheaper because of competion in the busy seaons). Lots of people take buses from Buenas Aires to Bariloche. I think it takes 22 hours and it apparently pretty confortable with movies and such, and not too expensive. You can get seats called totacama that turn into a fully reclined sleeping surface. I flew so that I could have more time for skiing. You can find an overview map of the Bariloche region online at this website. This online store sells most of the maps I used, or check out this store. Some topo maps were a bit tricky to find. There are great topo maps available in Bariloche (at the tourist shops and bookstores) for Volcan Lanin, Volcan Villarrica, the hut chain (frey, jakob, italia and lopez), Tronador and El Bolson. It is also possible to get custom made topo maps for many regions of the andes at a GIS company in Bariloche called Aoneker GIS (email: aoneker@speedy.com.ar phone: +54 (2944) 433945 cellular: 15634244). It is located on the 4th floor of a building near the movie theater. The owners of this business said that they could ship the topo maps to people anywhere in the world if the people paid via Western Union. Apparently you can also buy Military Topo maps for Argentina in Buenas Aires. Here are the maps that Aoneker sells. For topo maps of Chile I got lucky. I traded my Lanin map for maps of Lonquimay and Llaima with some French skiers who were doing similar peaks but in the opposite direction. We met them on the summit of Villarrica. They had the proper military topo maps that you can buy in Santiago at Instituto Militar, Dieciocho 369, Centre of Santiago. One series of commercial maps for Chile is produced by “JPL Mapas”. These were the best road maps and also had some reasonable topos for Volcanoes in Chile. The useful ones that I bought were: 11 – Bariloche, 15 – Rutas de los Jesuitas, and 14- Lagos Andinos. You can buy them online here. I think you could buy them in bookstores and tourist shops in touristy places like Pucon. Aparently topo maps for Chile can be printed from the website: www.igm.cl but I believe it is a subscription service. However, there is an internet cafe in Pucon which is located in the same block as the Civic Centre and the Bomberos (fire station) where you can reportedly use this website to print maps. We used John Biggar’s The Andes – a Guide for Climbers and the Lonely Planet Guide to Trekking in the Patagonian Andes for route information. There is an upcoming guide for ski touring the Volcanoes of the Andes. You can find information about it at belupress.com. The guidebook will be available in French/Spanish and English/Spanish, and should be for sale online in January 2007. In September or November the hut-to-hut traverse: Frey-Jakob-Italia-Lopez looks great. A traverse from Refugio Lopez to Tronador looks like a lot of fun. I’ve got a bunch of weather forecasts listed on the right side of pages on my blog: http://matosan.blogspot.com. The Snow Forecast seemed the most accurate. The Chile Meteorlogical Service seemed pretty pessimistic to me.